This is the next installment from the Anarchist Current, the afterword to Volume Three of Anarchism: A Documentary History of Libertarian Ideas, in which I survey the origins and development of anarchist ideas from ancient China to the present day. 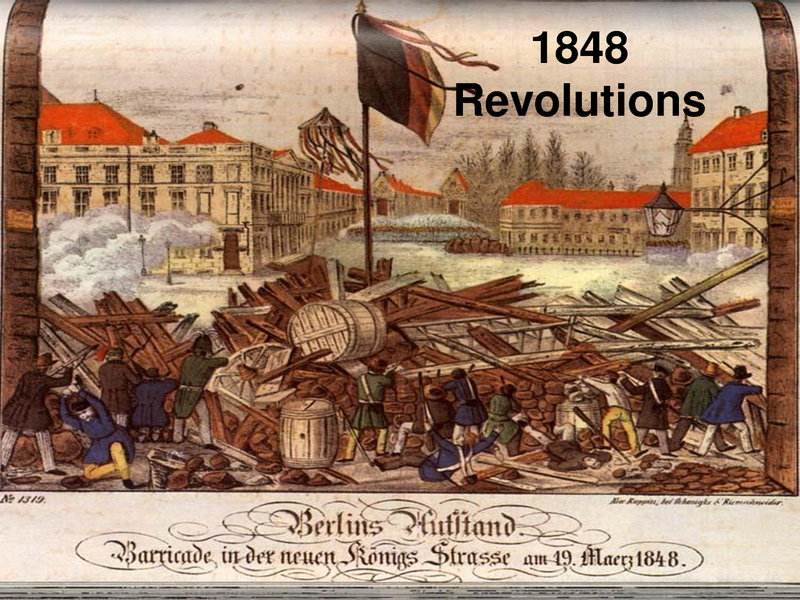 In this section, I discuss the role of anarchist ideas in the 1848 revolutions in Europe and their immediate aftermath, with a focus on Proudhon, his anarchist critic, Joseph Déjacque, Anselme Bellegarrigue, Carlo Pisacane, Ernest Coeurderoy and Pi y Margall. 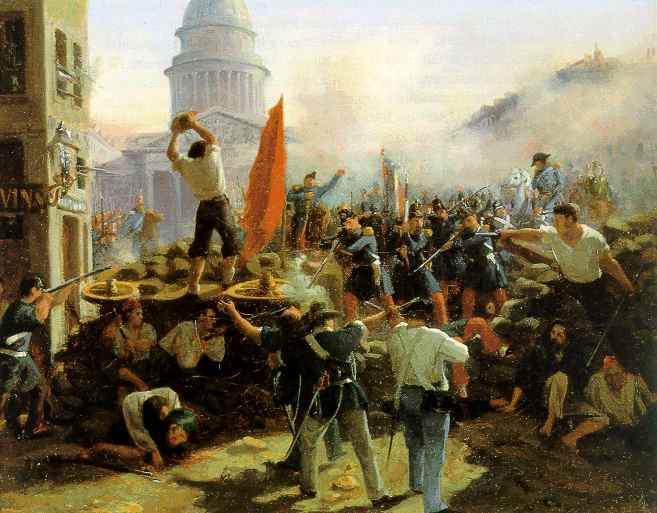 In early 1848, revolution broke out in Sicily, quickly spreading throughout the Italian peninsula. The February 1848 Revolution soon followed in France, with the king being overthrown and a provisional republican government proclaimed. 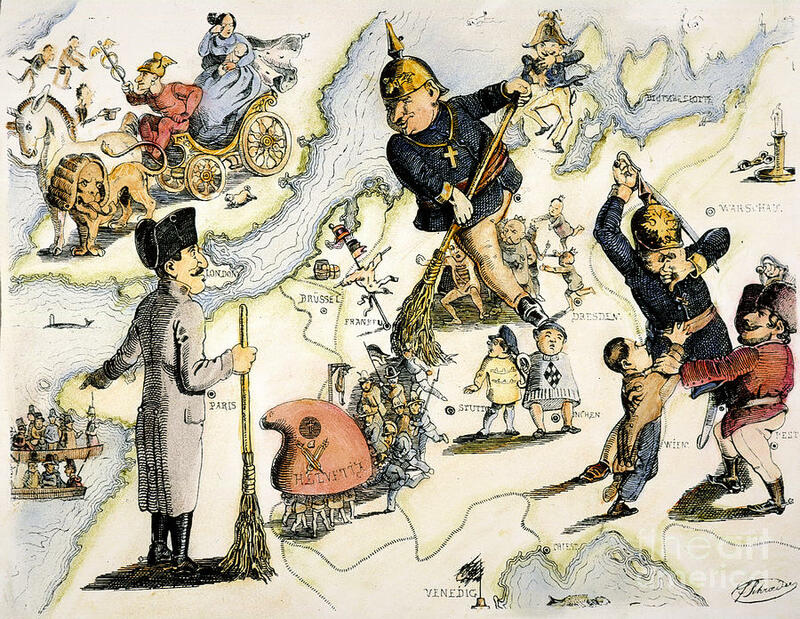 There were revolutions in various parts of Germany and Eastern Europe (with Bakunin somehow managing to take a part in most of them until his arrest in Dresden in May 1849). Anarchist ideas began to gain some currency, particularly in France, in no small part due to Proudhon’s own efforts. The provisional government in France instituted universal male suffrage, which Proudhon referred to as “the counter-revolution” because the election of representatives, no matter how broad the electoral base, gives power to those representatives, not of the people, but of particular interests, legitimizing rule by those interests by making it appear that a government elected by universal suffrage represents the interests of the people. In fact, the Constituent Assembly elected in April 1848 was dominated by right-wing and bourgeois representatives. Rejection of and opposition to representative government and participation in parliamentary politics distinguished the anarchists from other socialist currents and helped lead to the split in the First International between Marx and his followers, who advocated the creation of national political parties to represent the interests of the working class, and the proto-anarchist anti-authoritarian federalists associated with Bakunin (Volume One, Chapters 5 & 6). In The General Idea of the Revolution in the 19th Century, written from prison while Proudhon was incarcerated for having denounced Napoleon III as the personification of reaction, Proudhon wrote that the “fundamental, decisive idea” of the Revolution is this: “NO MORE AUTHORITY, neither in the Church, nor in the State, nor in land, nor in money” (Volume One, Selection 12). He described the law as “spider webs for the rich and powerful, steel chains for the weak and poor, fishing nets in the hands of the government,” advocating in their place a “system of contracts” based on the notion of equivalent exchange (Volume One, Selection 12). While subsequent anarchists were, for the most part, to reject Proudhon’s notion of equivalent exchange, they concurred with Proudhon that social relationships should be based on free agreements between individuals directly and between the various voluntary associations to which they may belong (Graham, 1989). In Spain, anarchists referred to these agreements as “pacts” (pactos). In 1854, Francisco Pi y Margall (1824-1901), who introduced Proudhon’s ideas to a Spanish audience, argued that between “two sovereign entities there is room only for pacts. Authority and sovereignty are contradictions. Society based on authority ought, therefore, to give way to society based upon contract” (Volume One, Selection 15). Not only in Spain, but throughout the nascent international anarchist movements, anarchists advocated contract, conceived as free agreement, as the means by which people would voluntarily federate into broader trade union, communal, regional and international organizations with no central authority above them, with each person and federated group being free to disassociate or secede from any federalist organization (Graham, 1989). They agreed with the argument put forward by Proudhon in his influential book, On the Political Capacity of the Working Classes (1865), that without the right of secession, federalism would be “merely an illusion, empty boasting, a lie” (Volume One, Selection 18). In the aftermath of the 1848 French Revolution, Proudhon was not alone in advocating anarchy as a positive ideal. 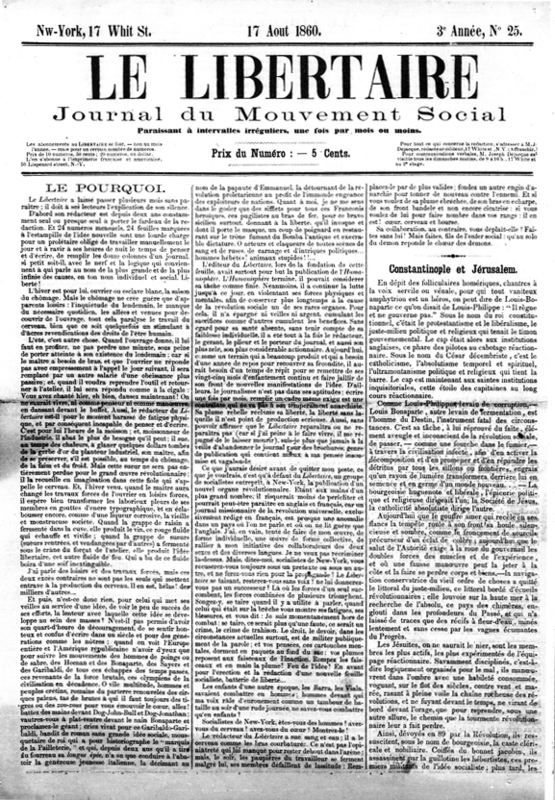 In 1850, the young journalist, Anselme Bellegarrigue, briefly published a newspaper, L’Anarchie, in which he argued that “anarchy is order, whereas government is civil war” (Volume One, Selection 13), echoing Proudhon’s comment in What Is Property that society “finds its highest perfection in the union of order with anarchy” (Volume One, Selection 8). 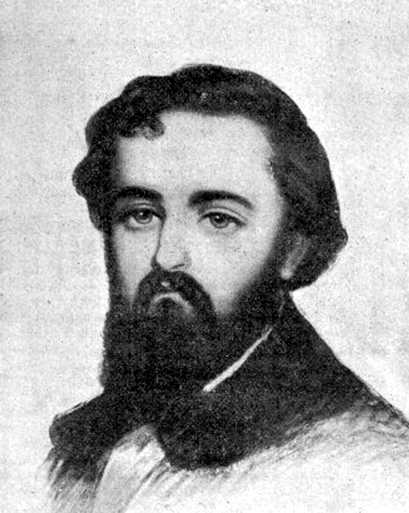 The Italian revolutionary, Carlo Pisacane (1818-1857), demanded the abolition of all hierarchy and authority, to be replaced by a form of socialism similar to Proudhon’s mutualism, based on voluntary contract and “free association”. Anticipating the doctrine of “propaganda by the deed,” Pisacane argued that the most effective propaganda is revolutionary action, for ideas “spring from deeds and not the other way around” (Volume One, Selection 16). Déjacque’s anarchist critique was much broader than Proudhon’s. Proudhon saw the patriarchal nuclear family as the basis of society, and argued that woman’s place was in the home. He did not advocate the complete abolition of property, arguing instead for a fairer distribution of wealth based on individual contribution and equivalent exchange. Déjacque took Proudhon to task on both points, arguing for the complete abolition of “property and authority in every guise” (Volume One, Selection 17). He rejected Proudhon’s mutualism as a “system of contracts” for determining each person’s “allotted measure” of things instead of everyone having access to whatever their “nature or temperament requires.” Déjacque believed that everyone should be “free to consume and to produce as they see fit,” advocating a form of anarchist communism twenty years before similar views were to be adopted by anarchists associated with the anti-authoritarian wing of the First International (Volume One, Chapter 8). “In every land there are folk who are kicked out and driven away, killed and burnt out without a single voice of compassion to speak up for them. They are the Jews.—I am a Jew. Everywhere, there are people banned from promenades, museums, cafes and theatres because a heartless wretchedness mocks their day wear. If they dare to show themselves in public, every eye turns to stare at them; and the police forbid them to go near fashionable locations. But, mightier than any police, their righteous pride in themselves takes exception to being singled out for widespread stigma.—I am one of that breed” (1854). Graham, Robert. “The Role of Contract in Anarchist Ideology.” In For Anarchism: History, Theory and Practice. Ed. D. Goodway. London: Routledge, 1989.